Mall Road Shimla Tourist Hotel..
"Puddles with little rainbows along the path of green, water like mystical, cascading veils of white cleansing the mountainside, inviting you silently but surely to come and splash in the spray of tiny droplets"
Himachal seems to come alive during the monsoon season. This is the time when the landscape of the state is covered by lush greenery. Kufri is at its magical best during this time. The rains arrive, bringing with them the promise of months filled with pattering showers, lush green hills with many waterfalls playfully tumbling down them and days are spent looking out at the rain through a wet window, smiling at a paradise that has been found. Pick and drop from Delhi with Swift/Indigo Similar. A perfect reprieve from the stressful life in city, Kufri can be your salvation during this wonderful season. Drive here amidst the misty roads, drizzle and hot tea by the road and start your getaway amid serene natural surroundings. Package mentioned above is flexible & can be modified on request. Check in to the Resort,have some rest & evening at your leisure. You can opt to visit Indira Tourist Park which is one of the prominent tourist spots in Kufri,located at a five minutes walk from resort. You can enjoy yak and pony rides in this park. A café is also present in the park that serves mouth watering snacks and beverages.In the evening have your dinner at the resort & a comfortable sleep. After a scrumptious breakfast, you can go for local sightseeing in Shimla, visiting the focal point of Shimla that is the Ridge and The Mall running around its south slope. From the Ridge, the town spills downwards, with winding roads linking up settlements and stone steps connecting each layer. The Cart Road encircles the base of the main settlement, and is the highest motorable road of Shimla. The Mall is open only to pedestrians. There is a lift run by the Himachal Tourist Department that connects the railway stations and Cart Road to the Mall. The Mall is the main attraction in Shimla, lined with shops selling woollen garments and shawls, handicrafts, departmental stores, eateries and old colonial timber houses. There is a palpable change of character from the times when the Mall was strictly out of bounds for all natives except royalty, to Indian crowds that walk down it today. At the eastern edge of the Ridge is the famous Christ Church, which was consecrated in 1857. It is a prominent yellow painted building with a Victorian-Gothic spire. In the church some of the finest stained glass windows in India depict faith, hope, charity, fortitude, patience, and humility. Near by to the church is the mock- Tudor Library,which was built in 1910.On the other extreme of the Ridge is the Scandal Point. A statue of the Lala Lajpat Rai dominates the place and groups of local people gather here in the afternoon for some casual chit-a-chat. The temple of Kali Bari is near by to the Scandal Point enshrines the idol of Shyamla Devi, the presiding deity of Shimla. Town Hall reminds of the colonial past of Shimla, the timber lined General Post Office and the old Gaiety Theatre remind of teh Britishb Era. This popular hall was home to the Shimla Amateur Dramatic Society, complete with a gentlemen’s club where the discussion veered around the noble pursuit of cricket and horse racing. Down from the Mall stands the gracious Cecil Hotel, originally built in 1877 and now rebuilt to its original grandeur. The Lakkar Bazaar is famous for its woodcrafts and souvenir shops. The other important church, St. Michael’s Cathedral, which is built like a cruciform, is just off the Mall. Vice Regal Lodge, now known as the Rashtrapati Niwas (President’s House) is the most impressive colonial edifice of Shimla,located on the top of Observatory Hill, this Elizabethan mansion was built in 1888 for Lord Dufferin. It now houses the Institute of Advanced Studies, and is open only in some parts to the public. The grey building still retains its grandeur, with a lion and unicorn guarding the entrance, immaculate lawns, and original brass fire hydrants from Manchester. The Lodge has a chapel and an indoor swimming pool. Inside, the rooms have rich woodcarvings and wooden panelling. The Prospect Hill is a popular picnic spot , it can be reached by a short cut through the forests west of the Viceregal Lodge. A tarmac path leads up to the top at 2,176 metres, crowned by the Kamana Devi temple. Here you can view the southern side of Shimla, the undulating hills and valleys of southern Himachal and beyond to the plains of Punjab in the distance. The Jakhu Temple, sitting on top of Jakhu hill at 2,455 metres is the highest point on the ridge. This temple is dedicated to Lord Hanuman. Shimla has some other interesting places in Shimla that warrant a quick tour. Some are The Glen, a thickly wooded area 4 kms to the northwest past the Cecil Hotel, Chadwick Falls, at 1,586 metres where the river drops 67 metres and is best visited during the monsoons, Tara Devi Temple, the Sankat Mochan Temple about 7 kms on the Shimla-Kalka road and the Himalayan Aviary close to the Viceregal Lodge, with a selection of birds like the monal, pheasant, pea fowls and peacocks. The Summer Hill is in suburbs of Shimla and is located about 5 kms away the town and a stop on the Kalka-Shimla rail line, has quiet walks through wooded surroundings. The Himachal Pradesh University is also located here. After breakfast you will proceed to seeing kufri like Himalayan national park, indira Gandhi national park and after that in evening come back to overnight stay at hotel in kufri. Himalayan Nature Park-This park is located at 5 minute walk from the Resort. The park has a unique collection of birds and animals that can only be found in the higher reaches of the Himalayas. The natural habitat of the Nature Park has been used to house selected Himalayan animal species primarily for the purpose of education of visitors. However, the animal enclosures here are big enough to provide opportunity to the wild animals to be in near natural habitat.Other attractive animals in the Nature Park include Musk Deer, Bharal, Black Bear, Tibetan Wolf, Leopard Cat, Sambhar, Ghoral, Barking Deer, Monal, White Crested Kaleej and Cheer pheasant. Mahasu Peak- Mahasu Peak is the highest peak in the region of Kufri. From this peak, you can clearly see the Badrinath and Kedarnath Ranges. You can enjoy adventure sports like trekking , skiing, and hiking here as it is nestled on a high altitude. These adventure sports are carried out under the supervision of experienced trainers. You can bring your own equipment or can rent the sporting equipment.The Nag Devta Temple, dedicated to a Serpent God, is an additional attraction of this destination. To reach Mahasu Peak, you can take a short hike from Kufri Holiday Resort, passing through forests of Himalayan cedars. Naldehra-Naldehra(2204) is just 19 km from Kufri Holiday Resort .Its a heaven for tourists. It boasts of the oldest 9 hole golf course in the country. The well groomed Golf Course is a lovely verdant, perhaps one of the finest and sporty in India. Crowned with a springing turf the Golf Course was suggested by Lord Curzon. He was so enchanted by the place that he gave his daughter Alexendra, "Naldehra" as her second name. The Nag temple is also situated here and Naldehra derives its name from it. Mashobra- About 10 kilometers from Shimla is a quaint little town called Mashobra. Started by the English when they established Shimla, Mashobra has since grown and houses some amazingly beautiful spots that as yet have not been crowded out. To begin with, up the mountain is an enchanting little meadow called “The Talai” by the local inhabitants, and the road leading to this meadow meanders alongside the now rundown estate of the Maharaja of Faridkot. This ramshackle palace houses one of the most incredible collection of vintage cars and motorcycles. Further on the road leads on to a beautiful garden on top of the mountain called Cragnaino. Created by the English, Cragnaino has some rare species of flora. Fagu-Just 6 kms from the resort this tiny village situated aside a saddle-like mountain along Hindustan Tibet Road. A rare range of views is visible from here, which include vivid dales and snow clad peaks. The picturesque countryside is dotted with clusters of villages, fruit gardens and nearby terraced fields. Fog characterizes the hillside landscape endowed with romantic ambience. Most of the area is covered with conifers of Himalayan cedar and spruce. 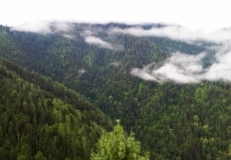 Located at an altitude of 2,450 m, Fagu, perhaps have derived its name from the fog itself. Narkanda- Narkanda is situated at a distance of 48 kms from Kufri Holiday Resort at an altitude of 2708m from sea level on the Hindustan Tibet road. It offers a spectacular view of higher snow ranges. An uphill trek (8 km) through deodar woods leads beholder to Hatu Peak famous for ancient Hatu Mata Temple (3475 m) which is now connected with a motorable road. It is suggested to take Kufri- Chail- Chandigarh route so that you can visit Chail while returning back from Kufri. Chail is 26 km from Kufri or an hour's drive though beautiful oak and pine forests. The Maharaja of Patiala built it as his summer retreat following a restriction on his entry to Shimla. The place is well known for its cricket and polo grounds, which are at an altitude of 2,250m making it the highest pitch in the World. Chail is also considered a hiker's paradise with a dozen trek routes leading out of Chail to Choor Peak, Shimla and other Himalayan areas. You can also visit the Chail Sanctuary, home to leopards, Indian Muntjac, Sambar, Goral, Barking deer and the Himalayan Black Bear among other animals and birds. After breakfast proceed to visit mashobra like Reserve Forest sanctuary Mashobra seeing full day there and in evening come back to overnight stay at hotel. The natural vegetation comprises pine, oak, cedar or Himalayan deodar, and rhododendron, as well as maple and horse chestnut. The wildlife consists of monkeys, baboons, jackals, kakkar (barking deer), and the occasional leopard, as well as numerous bird species such as the Himalayan eagle, pheasants, chikor and partridges. After breakfast check out from hotel and proceed to Naldehra, check in to hotel and after that seeing beauty of naldehra after that come back to overnight stay at hotel. Today after breakfast you will visit naldehra golf course and you can enjoying the horse riding(on direct payment basis) and after that visit to the Mahunag Temple which is dedicated to the snake god and incidentally this is where Naldehra gets its name from. Naldehra got its name from the Nag Temple (or Dehra of the god Nag) which lies bang in the centre of the course. After that in evening night we come back to hotel and overnight stay there. Next Day after breakfast we proceed to Delhi and after 7 hours journey we reach there and drop you at Airport/Railway Station.